The strange and the fanciful world of machinery and contraption isn’t new. As the historian and author E.R Tuitt has recently described, ‘robots came to Europe before the dawn of the mechanical age’. 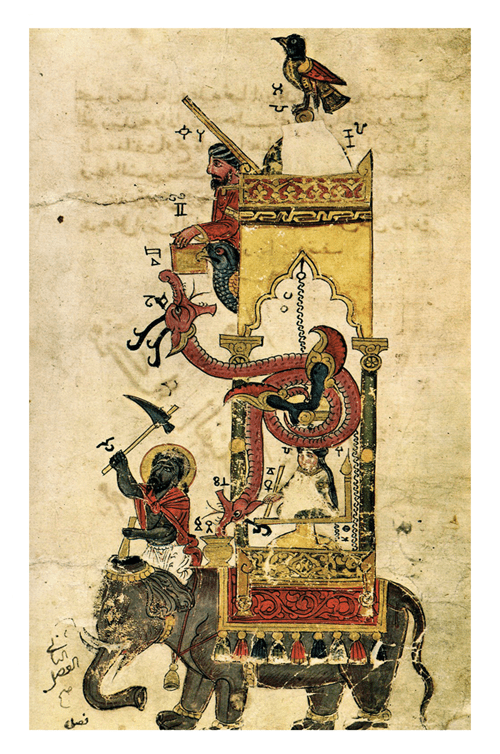 This is an image of the ‘elephant clock’ and it comes from the 12th century C.E. We’ve had an ongoing fascination with machines that are beyond our control for a long time. By the 8th century C.E., human beings were already exploring the fantastic, the weird and wonderful aspects of inorganic life through ancient automata. What we call ‘uncanny valley’ today was known as ‘the preternatural’ then, ‘praeter naturalis’ meaning ‘beyond nature’. The rational and the predictable; the strange and unexplained. These two opposable forces have had human destiny in their sway for millennia. ‘Magic’ and ‘logic’ had created a binary duality already fully embedded as part of the human experience by the Middle Ages. History suggests that a modern world made of encoded knowledge may lead to a new level of critical questioning as we go digital, in the same way as was triggered by ancient automata. Will there still be still room for enchantment in the coded era? Will we have erased the idea of there being unknowns or, alternatively, have embraced liminal thinking as a quintessential, even sacred, element of the uniquely human condition? An emergent code might accommodate a new level of human imagination as we grasp these questions. An evolutionary shift may come from the acceptance that humans are unable to know as much as the machines now do; that what we have been playing with as automata, and algorithms, we now must concede are playing with us. This would be an ultimate, but also a very ancient ‘diabolical trickery’. And, as it was twelve hundred years ago, so might we find ourselves on the cusp of new horizons, answering new fundamental questions about knowledge, nature, and divine purpose, as ushered in by the automata. I can’t find a definition for autonoma that matches the way you use it. Can you clarify? Liminal thinking is a marvelous concept. Hope his book becomes a reality; can’t find anything firm about it. Hey Joel, Here are a few links for you. The Wikipedia reference is for the singular automaton here https://en.wikipedia.org/wiki/Elephant_clock#Automaton. And here are some Google references https://www.google.co.uk/webhp?sourceid=chrome-instant&ion=1&espv=2&ie=UTF-8#q=Automaton. Here are some references for liminal thinking too https://www.google.co.uk/webhp?sourceid=chrome-instant&ion=1&espv=2&ie=UTF-8#q=liminal%20definition. I know Dave, and am pretty sure a book is on the way. Watch that space. Thanks for your comment. Good to hear about the book. My first question was about the word autonoma which I still can’t find anywhere. Hi Joel, It came out of the writing. I may have made it up! But it sounds so much like a word. I was surprised I didn’t know it, and more surprised I couldn’t find a definition. There’s always room for more words… and more definitions.